(The Bieh Telegraph)—-Today President Salva Kiir Mayardit in decree announce through the state broadcasting cooperation removed his notorious army chief 1st Lieutenant Paul Malong Awan Anei and replace him with another General who serve as the D/cogs for Admin and Finance. However, the news has not been a good news to many supporters of Malong popularly known as king paul. Malong was seen making telephone calls directing his sub-clan in Mading Awiel to prepared a communal fight against the clan of the President. 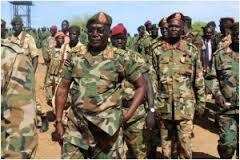 Meanwhile, General Malong Awan according to eye witnesses in Juba said they believe He left the town this evening. “Malong left his house with a pocket of soldiers and he is destine to Bhar el ghazal” said the witness who refuse to tell us his name. he added that he uses the route to Maridi than to Bhar el gazal. This entry was posted in Letters & Interviews and tagged South Sudan War. South Sudan Students in Zimbabwe Shutdown the Embassy. Breaking news Paul Malong Arrived at Juba International Airport.